No doubt one of the reasons you train is so that you can project a “don’t mess with me” image to fools who might otherwise try to get in your face. But your muscles fail to intimidate a would-be attacker, you’d better have the power to stop him in his tracks. We asked three martial-arts training experts to show you how to use your gym time to build devastating fighting power. Wedge one end of a barbell into the corner of a room (the edge of a bench can also be used). You may want to wrap the end of the bar in a towel to prevent slipping or damage to the walls. Place a light weight-plate on the other end of the bar, and grab the bar with your right hand near the edge. Get into a fighting stance, left foot forward (or right foot, if you’re a southpaw) and knees bent. Now bend both your knees and transfer your weight onto your back leg, as if you were crouching down before a jump . That’s one rep. Immediately return to the starting position and repeat. Perform five sets of 5-6 reps, resting 60 seconds between sets. 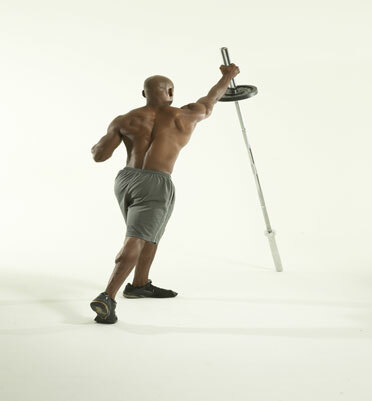 Grab a barbell with an overhand grip, hands slightly wider than shoulder width. Get into pushup position on the floor . Jump your feet forward and plant them about hip-width apart. Arch your lower back, and explosively stand up and shrug the bar, coming up onto the balls of your feet. As the bar rises to chest level, flip your wrists over so that your palms face the ceiling and your upper arms are parallel to the floor. Allow your knees to bend as you absorb the force of the bar at your shoulders . Reverse the motion to return the bar to the floor, and shoot your legs back to pushup position. That’s one rep. Perform four sets of 3-5 reps, resting 60 seconds between each set. “If you have a glass jaw, no amount of training will save you from waking up on the floor,” says Jason Ferruggia, a performance-enhancement coach in Warren, NJ. “But you can improve your ability to take a punch by strengthening your neck.” Perform this neck flexion exercise. Grab a light weight plate and wrap it in a towel. Lie back on a bench so that your head hangs off the end. Hold the plate against your forehead . Now flex your neck, raising it as high as you can. Lower your head to return to the starting position. That’s one rep. Perform two sets of 20 reps, resting 90-120 seconds between sets.